New Times With Old Friends | Hello Cool World! Time and distance mean nothing to good friends. It just gives you more to catch up on. 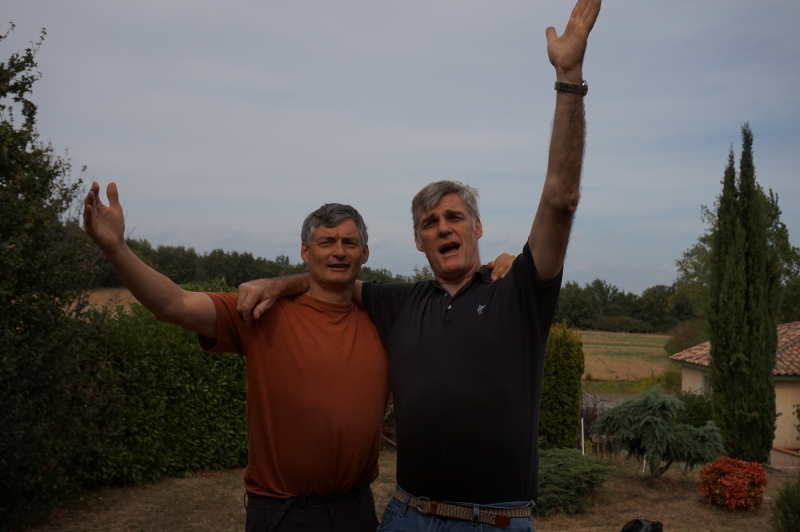 Who would have thought that we would have not one, but two old friendships to reconnect with in Toulouse? 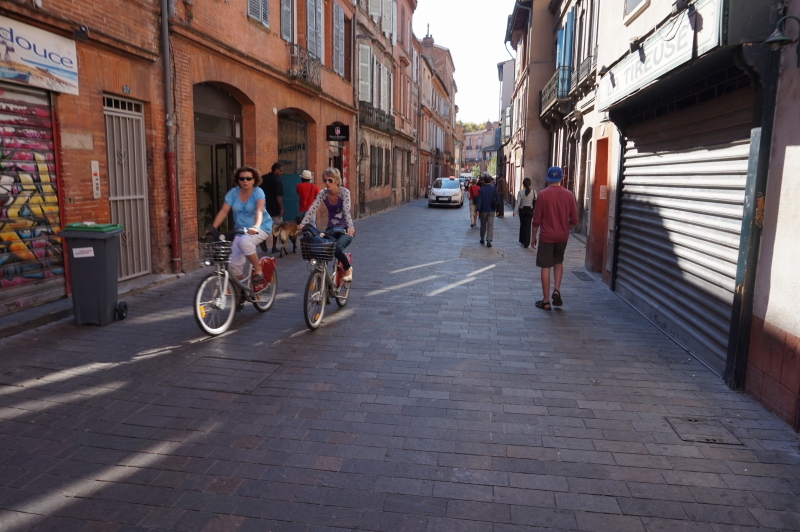 Downtown Toulouse is a combination of haute couture and old streets. Sort of like what Yorkdale is, only much bigger. It’s not quite car free, but it’s clear that pedestrians rule the streets, especially where there are no sidewalks. Even the buses are scaled down and blend in with the local scene. What Yonge Street should look like. 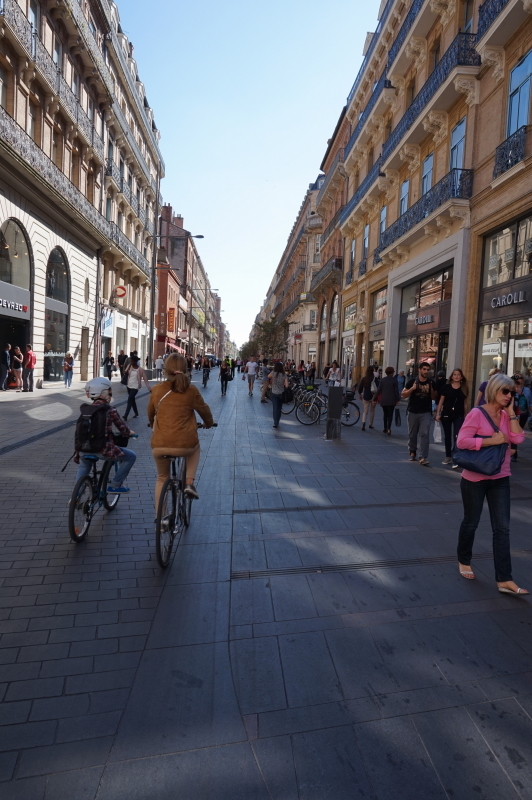 Toulouse: downtown streets that are meant for strolling. 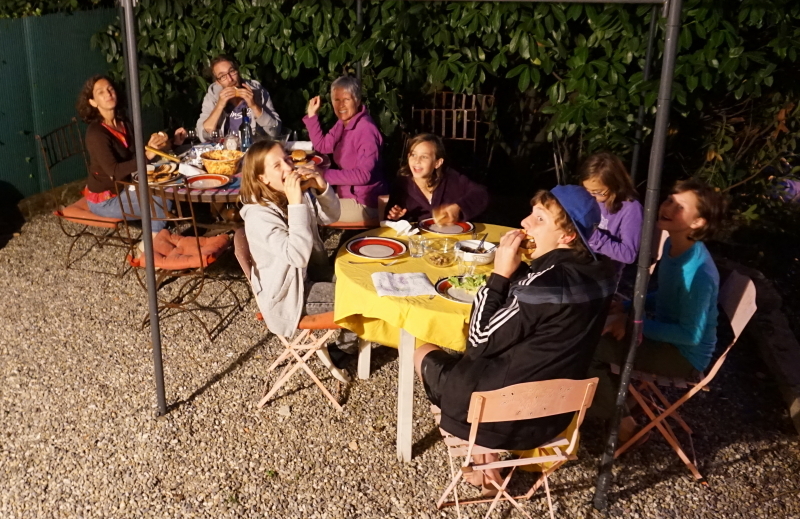 Eating ‘les hamburgers’ with Anne, Fabrice and the girls. If anyone has ideas for the quintessential Canadian recipe that can be adapted to local ingredients, let us know. We tried our hand at making Canadian hamburgers on the second night, and had to improvise a bit to cover for the lack of relish, bulk ground beef and hamburger buns. On our way to the store, Nancy and I noticed that all the local houses had been built with walls and fences and the shutters were all closed up tight. It’s a safe neighbourhood, Anne tells us, it’s just another cultural difference that people don’t interact with their neighbours that much. Score one for walking up Sorauren and being able to chat with friends and wave to Dion on the front porch with a beer. 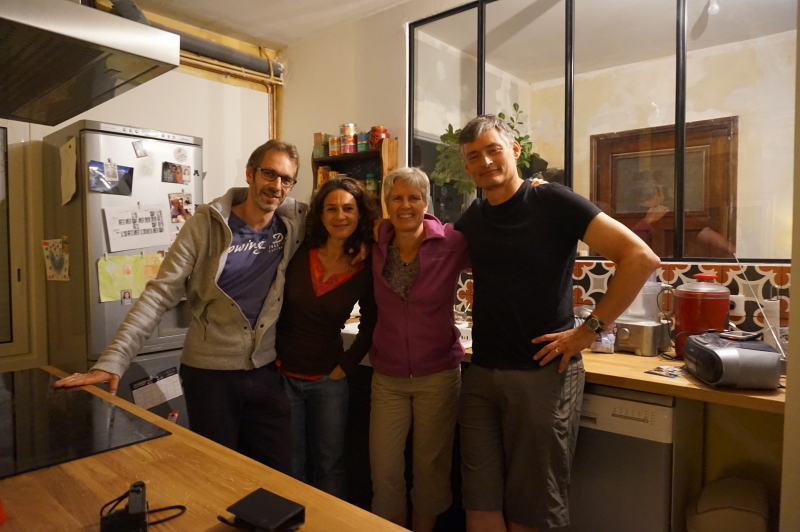 From inner Toulouse, to the ‘burbs, we then went to visit my high school chum, Chris, with Sandine and Richard. Chris and I have an unwritten rule of getting together once every ten years… or it just seems to work out that way. With a house in the country, two dogs, and a swimming pool, we took the opportunity to relax and enjoy ourselves (not that we weren’t already relaxed and enjoying ourselves). We visited another fine example of a local market, this time on Saturday morning in the town of Muret. 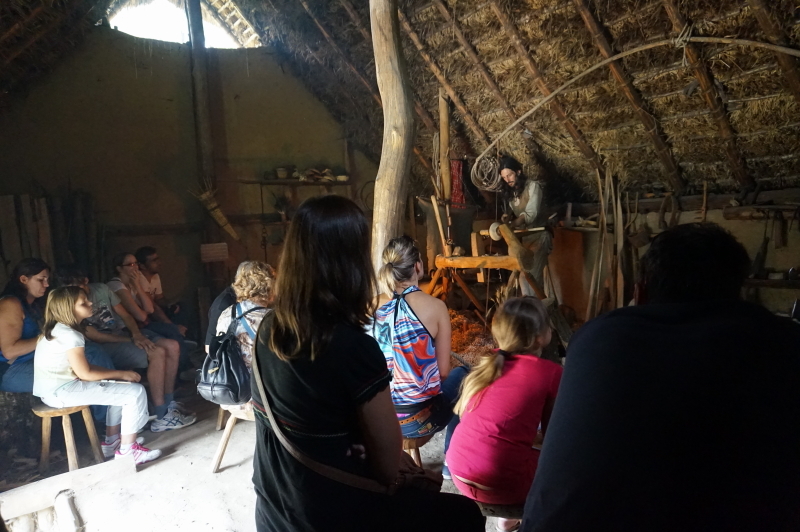 At some point along the trip, Nancy had remarked, “France is still very much an agricultural country”, and the community markets we have seen in every town back that up. The cheeses, sausages, breads, and fruits were so flavourful and such good value. It made me think of the of all the hard work being done by the West End Food Co-op, Sorauren Market, and all the folks across Toronto who are reintroducing farmer’s markets back into our culture. Keep it up, my friends. Raising a glass with Richard, Sandine, and Chris. 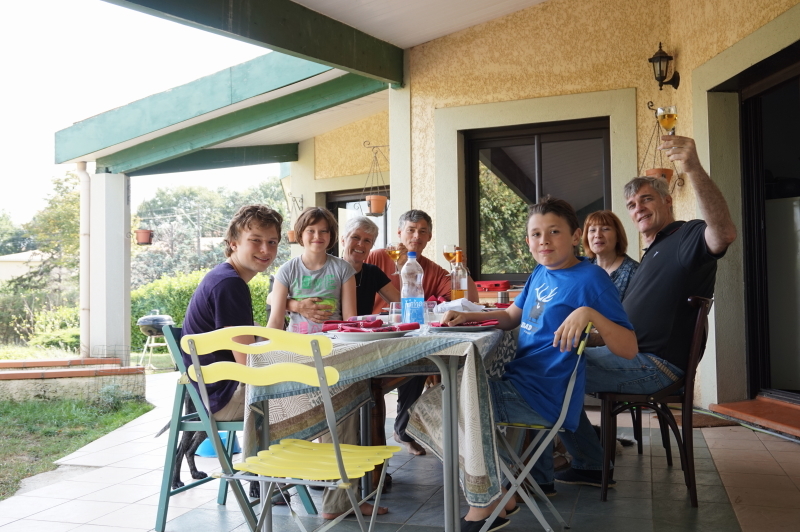 Not wanting to miss an opportunity for more history, Nancy and I drove to an old Gaulois village. 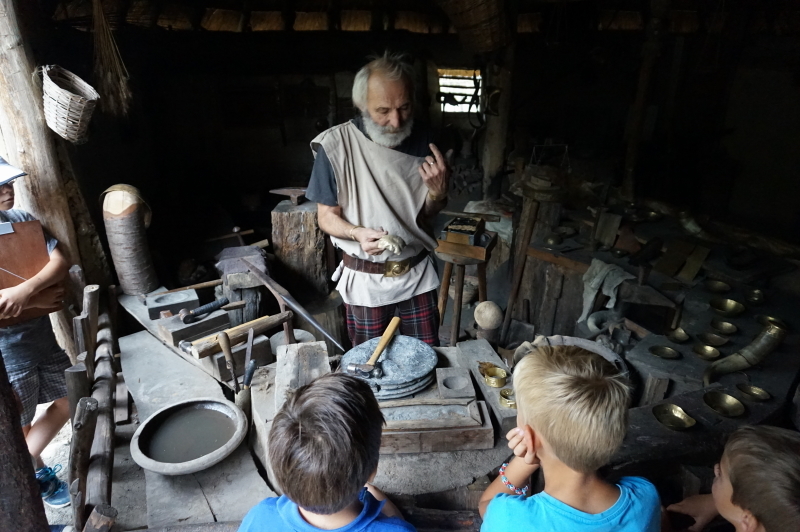 It was much like Black Creek Pioneer Village, except it was showcasing a culture and skills that were nearly two thousand years old. Very cool, and not one person made a reference to Asterix! Turning bowls on a lathe, and spinning stories. It was so great to spend some time with friends, and we look forward to seeing them again in Toronto next time. Sounds like you are having a fabulous time! I was amused to see that the canoe Aran was in was an Old Town from Maine. The same as our canoe which is an Old Town Tripper. Keep the stories and photos coming! What a blast you must be having! Wishing you continued Joy and happiness on your great adventure. xo RachelleOnly those who will risk going too far can possibly find out how far one can go.